Studs – Vermont Tire & Service Inc.
Studded tires have been around in one form or another since about 1890. Modern studded tires first took off in popularity in the 1950’s in Scandinavia where they were used to increase traction on icy roads. Studded tires then took hold in the US in the 1960’s and enjoyed growing popularity into the 1970’s. The late 1970’s through the 1990’s produced technical improvements in studded tires as well as governmental restrictions on their use in an effort to limit pavement wear (In Vermont, there are no such laws, but most states and provinces do have these laws. In the northern states, the dates are a good guideline of when you should put on and take off your winter tires anyway). The typical studded tire is a winter tire with small metal studs (many winter tires can come studded or studless). 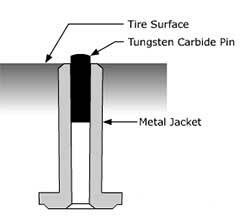 These studs are usually made of tungsten carbide (an extremely hard metal) and have a small metal “jacket” that inserts into the tire with a tungsten carbide pin inserted into the jacket (see figure on right). This pin is tapered so that it will move back into the jacket when the dynamic forces acting on it reach a certain critical level. If this subtle stud movement is properly calibrated the result is a tire stud that maintains a near-constant protrusion length even as the rest of the tire wears down. 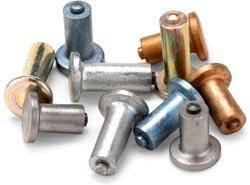 This type of stud is called a controlled protrusion stud. The total number of studs as well as their arrangement varies greatly among winter tires. If the tire is designed right, the studs will be arranged in a pattern so that they hit in 4 for more different spots of contact with the road. This ensures that every stud has a fresh spot on the ground for maximum traction. Some tires have as little as 2 contact points, some as many as 5. In the Vermont and Northeast environment, studs give improved ice and snow braking as well as improved lateral stability. Also, because of the mechanical connection to the road, studded tires lose traction in a more gradual and predictable way then their studless counterparts. They never totally lose traction no matter what surface you are on or how cold it is. This all adds to a safer more predictable driving experience. Studs also have a break in period in which the stud “sets”. During this period drive more gingerly and try to avoid spinning on start of sliding to a stop. When the nubs have worn off on the tread of the tire is a good indicator that the studs are set. Want Mark’s opinion on studs and studded tires? Who are they best suited for and who can go without? Check out his commentary “To Stud or Not to Stud” in Mark’s Blog.